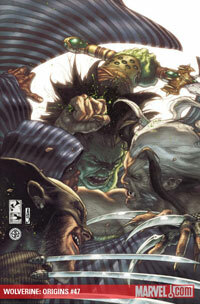 Wolverine: Origins #47: Skaar Smash! Hey, everyone, jrpbsp here…Here is the second part of the Origins tale, ‘Wolverine: Origins’. Hope you enjoy it. RECAP: The issue opens with Wolverine stabbing Daken with a sword apparently killing him. A man on site reports this to Romulus who orders him to follow the ambulance. The man refuses and Romulus has him killed immediately in a car accident. The ambulance turns around to help those victims since it appears that Daken is already gone. From a nearby roof Wolverine is watching and has Skaar attack Romulus as soon as he shows up. Romulus had believed that he had already gotten into Skaar’s head days earlier and convinced him to abandon Wolverine’s plan by offering to return Banner to the Hulk form. Romulus believed that Skaar wanted to go fist to fist with his father to prove his worth but in reality Skaar was more interested in matching brain power with Banner. But Romulus had prepared for this and had a group of Kurds waiting to attack. They are not able to hurt Skaar but they do distract his attention and call upon his rage. Cloak is forced to intervene in order to keep the fight from being a slaughter but once both men are present, one of the Kurds detonates a bomb and blows up the whole building. Romulus finds Logan and gives him a choice of helping his friends or finishing his rivalry. Logan chooses his friends. Romulus is interrupted by Daken who was stabbed by a fake Muramasa blade. He says that Wolverine is really playing Romulus. Wolverine enters the burning building trying to save people but Skaar has it under control. Meanwhile Daken explains that Wolverine has no intention of fighting Romulus. Instead he wants to expose the old villain and bring him into the light where all his power and control will evaporate. Daken does not want this because then he will have nothing to inherit. So he joins forces with Romulus to face Wolverine and Skaar. MY TAKE: Although this issue is a little bit more eventful then the last one, still not much happens. The entire issue takes place over the course of maybe twenty minutes and the longest scene was a flashback that had little bearing on the current story. Everything between Romulus and Skaar felt like filler that could have easily been shown in a single page or even a few panels. The cliffhanger of Daken’s death was completely wasted since there has already been confirmation of his survival and Wolverine would never kill him anyway. I am not really sure why the Kurds were present either or how Wolverine, who had enough time to change clothes but not scout the area apparently, would have missed them. If it was merely to show Romulus’ power and influence there are several better examples of that in this issue alone. Still, this was a better issue in that at least it did feel like the plot was being advanced, if slowly. Wolverine’s plan to not fight Romulus but rather to expose him is smart even if the whole scenario feels overdone these days. The same basic thing happened in a one shot a couple months ago with Mr. X. But at least this seems like it is heading for the final confrontation and that can only be a good thing. Although if his complete plan was to expose Romulus, the whole idea was so convoluted as to make no sense. Where are the reporters and news crews to give the revelation some weight? As much as I have gone on about disliking the story and much of the series in general, this could have been a pretty good plot. Wolverine building a strike force of heroes to take down an old and powerful foe is something I can get behind. Which is partly why I am very hard on the story, because it really should have been good. As it is, right now I just want to get through the last couple of issues so we can get to the series finale. As slow and bogged down as this story has been, the last two issues can only end on a high note for the overall title. 2 Comments on "Wolverine: Origins #47: Skaar Smash!"